Fallout 3 is set in the year 2277. 200 years after a nuclear war changed the world forever. The game occurs in and around Washington DC, an area that was devastated when the bombs fell. The city is a looming death trap ridden with super mutants and raiders, as well as the bleak wasteland, which is no safer. You start the game in Vault 101, an underground haven that has sheltered its inhabitants since the war began. Throughout the first hour or so of the game you play through various important stages of your life up to the age where your dad escapes the vault, and you, in your teenage naivety, follow him into the wastes to try and find out why he deserted you. That’s all the story info I will divulge as to not ruin it for you, but let me assure you it is a great story that doesn’t fail to impress. It will take you all across the DC Wasteland with a climactic ending. The characters that you meet along the way are fantastically realised and the voice acting is brilliant. Each character has some hilarious responses depending on how you choose to speak to them, and the options that you have to say lead to some bizarre encounters. The world of Fallout 3 is a bleak and uninviting place. The sun sets across the wasteland and leaves abandoned power stations and skyscrapers looming over the landscape. Factories and empty schools are the hideout for brutal raiders who kill without remorse. Super Mutants roam the streets of Downtown DC, while the Brotherhood of Steel keep watch on their base at the remnants of the Pentagon. You’ll meet an aristocratic maniac who has taken an old hotel tower as his home and will only let people who have the funds to pay him take refuge there. You’ll find a massive aircraft carrier that has been transformed into one of the cities largest communities, along with a town built around an unexploded atomic bomb. There is a lot to do in Fallout 3, and exploration is the best way to find quests and take on jobs. If you simply go through the main story doing none of the additional quests then you’ll find your world map looking greatly sparse. Fallout rewards the player for exploring; you’ll find rare items and weapons that you can play around with against the various enemies in the world. You’ll also be sent on some interesting and often dark side quests, with a large emphasis on choices and events that the player can manipulate to meet various different endings. My first playthrough was about 60hours, and I didn’t do everything the game had to offer. On my second playthrough, I reached about 80-90 hours of gameplay when I replayed the story and also completed all the main side quests; even then I wasn’t sure if I had played everything that the game had to offer. The art design in Fallout 3 is stellar. Everything is fabulously realised and well presented and really gives the player that you are experiencing a real breathing world. The game is constantly reminding you that life in this post-apocalyptic world is tough and merciless. Propaganda is spread across the world with the warnings of the impending nuclear attacks, while the word of the American Government is broadcast across the wasteland. The visuals of Fallout 3, while artistically pleasing, are not the greatest when scrutinised up close. The textures are muddy and blurred, while the character models look awkward and stiff. However, the vast draw distance is beautiful, and, at a distance, the game is a wonder to behold. You only have to wait till sunset and stand on a hill to look across the wasteland to see what I mean. 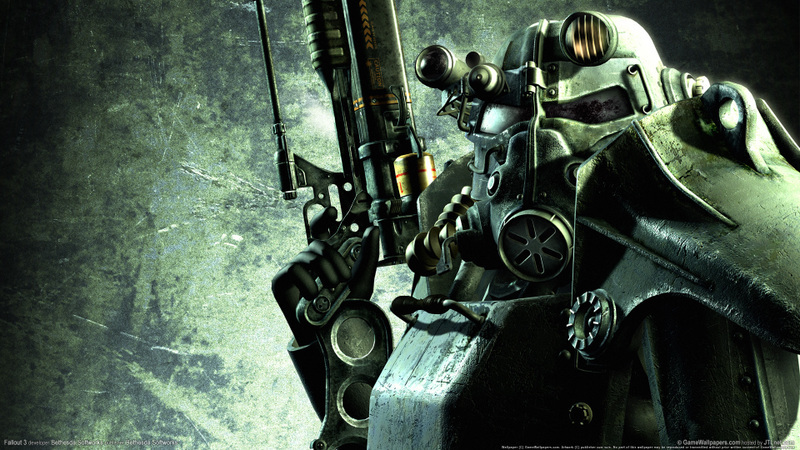 Visual hiccups are to be expected of a game of this scope, and sadly, Fallout is no exception. I had several problems with texture pop in, characters would disappear, dialogue would cut out and the occasional game crash. These problems are not game breaking, but they definitely detract from the immersion of the game. The audio quality is top quality. There are literally thousands of lines of dialogue in this game, with the vast majority of them well acted and unique. There are some hilariously evil characters in Fallout 3, and the dialogue portrays this perfectly well. Some of the responses you are able to say are just hilarious, and you will wish your character wasn’t a silent witness to everything that occurs, simply to hear him or her say the various different options you have in conversation. The soundtrack is equally great. It reflects the loneliness of this world, and is varied enough to feel fresh throughout. Each weapon also sounds different, with the standard affair of sound effects for standard pistols and machine guns, but more original sound effects with the Laser and Plasma weapons. One of Fallouts greatest strengths is the amount of ways you can choose to play. Almost every aspect of the game can be approached in a number of different ways. For example, at the beginning of the game there is an instance where you have to gain some information on your dad from the Saloon owner in Megaton. There are several ways you could approach this, for those who have chosen a character with a high speech-craft level, you can simply persuade him to pass on the information. For other players, you could either pay him off, complete a quest for him, or if you’re just plain evil you could kill him, take his key, break into his house and steal the information. These kinds of open-ended choices apply to almost every point in the game. The game can be played in a first person perspective, or a slightly awkward looking third person. The game was clearly designed with the intention to play in first person, but the third person does a pretty good job for those players who prefer to play this way. It’s a fairly standard western RPG affair, and any who have played Oblivion will be right at home with the gameplay here. The character customization in Fallout 3 is deep and engrossing. The clothing, armour and items you can equip your character with all look unique and detailed and it is addicting to mess around with the different combinations you can have. The weapons are also really cool to play around with. You can get your hands on some awesome weapons, including a Nuclear Bomb Launcher that decimates enemies in a mini mushroom cloud, or the Railway Rifle, one of the creatable guns in the game, which impales enemies’ limbs against the walls. You can probably tell from these descriptions that Fallout is a violent game, and it is definitely not for those easily offended or for those under the age of 18. There are some very gruesome scenes while you play through, and even I found myself quite squeamish at some of the brutal encounters. A game with awesome and original guns wouldn’t be very good without a good combat system. Fallout is a game that does not have this problem. There are two ways you can combat enemies in the game. The first is in real time, and while this may not be Halo or Call of Duty, the gunplay is definitely a good aspect of the game. However this is not the strongest aspect of the combat. That award goes to the original VATS system, or Vault-Tec Assisted Targeting System. VATS lets you pause the game and select which parts of the enemy you would like to shoot. This system works really well, and the combat is delivered in a cinematic slow-motion style that looks awesomely gruesome. It is a great way to give the player a chance to assess the battle when fighting multiple enemies and take them down systematically one by one. All of your items and quest info are stored on your Pip-Boy 3000, a device that you receive at the beginning of the game that is strapped to your wrist. It is a really original way of presenting an inventory in game, and although a simple feature that is practically a glorified menu system, it really helps to keep you engrossed in the game itself. As I mentioned earlier, life in the wasteland is tough. You will have to contend with the effects of the world on you as you travel around. Radiation is the foremost problem in the game. You gain radiation in various ways, such as drinking unpurified water or venturing to close to high level sources. If you let this radiation level get to high without taking medication or seeing a doctor, then your stats will start to become greatly affected and you will see your character start to struggle in battle. The leveling system in Fallout is really proficient. As you level up, you can boost your various skills, and also add perks. There are a lot of perks in Fallout 3, each of them boosting skills in various ways, with some of them adding some great gameplay mechanics, such as a perk that introduces a random event that when attacking a character, a mysterious man will suddenly appear in a duster coat and kill the enemy with his revolver. Another great perk is the ‘bloody mess’ perk, which allows the enemies the die in a ridiculously violent fashion. There are so many perks that you will definitely be encouraged to replay the game, simply to explore the different perk combinations that you can play with. Sadly though, Fallout has a level cap of 20, which is a shame because I had barely scratched the surface of the game once I had reached the max level, and it limits the addictive nature of leveling up. Bethesda has however announced that a future DLC pack will raise the level cap from 20 to 30, which will be a welcome addition. Fallout 3 is an exemplary RPG. It encompasses so much in such a fantastically well-realised world that it has been difficult to even consider playing anything else for such a long time. There are a few minor problems with the visuals, and has a few minor audio bugs, but these are minute compared to the huge amount of positive aspects where the game shines. Whichever way you want to play this game, the chances are you can. This is not, how it has been described up till now, ‘Oblivion with guns’, although even if it were, it would definitely not be a bad thing. Fallout stands alone as an almighty achievement in the gaming world and is definitely my favourite for Game of the Year. Even in this review I have not touched upon every feature this game has to offer, and the ones I have talked about have not been discussed in enough detail to do them justice, it would just take to long. All I can advise is that you go out and buy this game, and I assure you that your £40 will be well spent. There are easily 100+ hours here if you want to see all that Fallout 3 has to offer, and you definitely should.